Oh, this is one dish that is so easy to make, but so delicious with rice. 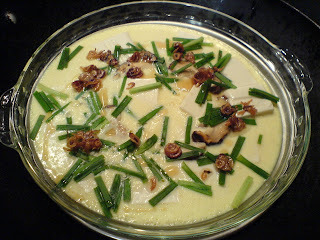 The egg turns out as smooth as silken toufu, with a savoury, fragrant aroma. In addition, you can add whatever ingredients to the egg mix you fancy - it only depends on what's available in your fridge, and what your tastebuds clamour for. 4. Fried shallots, a teaspoon of sesame oil and spring onions for garnishing. The method is to simply beat items 1-3 and pass the mixture through a sieve into a dish for steaming. The sieve will remove most of the bubbles so that you get a smooth texture for the egg. After that, you can then arrange the other ingredients you want into the dish. Finally, the crucial step is in the steaming of the egg itself. Make sure that the dish is covered when steaming. This helps prevent water condensing onto the egg mix, and scarring it; ensuring a shine to the egg. Steam with a very low flame - which means that you should not hear the rapid boiling of water that you usually do when steaming other dishes. Steam until the egg is set, which can be between 15-20 minutes, depending on the amount you made and the size of your wok/steamer. You can check whether the egg is set by using a knife and poking the centre of the dish. It's done when the egg doesn't run. 1. Assemble the egg mix as explained above. 2. 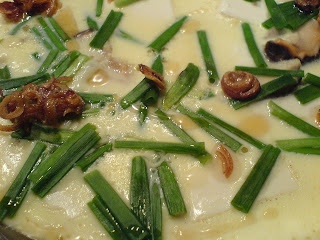 Arrange the mushroom and toufu as desired. 3. Cover the dish and steam for about 15 to 20 minutes on a low fire, until the egg is set. 4. Garnish with fried shallot, sesame oil and chopped spring onions. You might want to garnish with sliced fresh chilli if you like it spicy. 2. Arrange the toufu and quails' eggs as desired. You don't have to stop at 6 eggs - any number is fine. *winks* Put the salted egg yolk in the centre of the dish. Thanks for posting this recipe. I'mgoing to make this for dinner tonight.